I love ASOS, it is my go-to website when I want to look for unique & individual pieces. Always up-to-date with the latest trends, I can rely on them to find good quality items for a price I love. They mix cheap & cheerful brands with the more luxurious ones such as Free People, Wildfox & Mink Pink. A one stop shop for all your fashion needs, here are my top picks so far for March. This ASOS Maxi Dress with Tribal Necklace Print is an excellent way to wear two different trends at once – maxi & tribal. This beautiful dress with keep you cool & looking stylish this SS13. 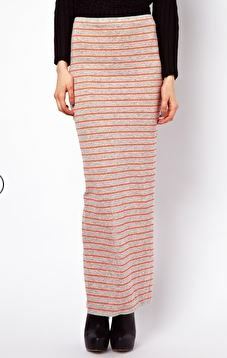 Brighten up your look & work the neon trend with this ASOS Maxi Skirt with Neon Stripe. Neon clothing can be a little daunting at first, but this lovely skirt is a great way to try out the trend in a subtle way without looking like a throw back from the 80’s! Tie dye, tie dye, tie dye, one of my most favourite prints. Stand out from the crowd & show your hippy spirit with this ASOS Maxi Skirt in Tie Dye with Fringing. A unique & fun skirt that is sure to put you leaps & bounds ahead in the style stakes this season. This ASOS Maxi Skirt in Mesh and Lace is a super cute way to introduce soft & delicate fabrics into your look. Perfect for working the feminine romantic trend this enchanting skirt will be a delightful addition to your wardrobe. 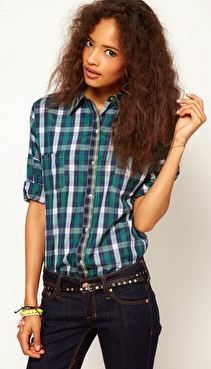 This ASOS Shirt with Mixed Checks is a true multi-tasker. The grunge trend has made another revival this season & shows no signs of slowing down. Checked shirts are a must have in any wardrobe, a really transitional piece that will see you through each season with ease. Check shirts are also brilliant for working a layered look. Team with skinny jeans or layer over a black maxi dress with biker boots for a grunge look that Courtney Love would be proud of! Let me know which your favourite piece is & how you would style it! I love ASOS, it still seems to be fashions best kept secret! I too love the tie die fringe skirt! Me too, it is so fun!